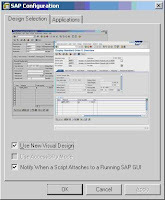 In one of my previous posts I stated several possibilities how to start ABAP debugger tool. Here comes some debugging specialties discussed. In this case you need to check out entry in table T000-CCATEGORY. This field is describing a role of client that you are logged in. If there is a value of P it is a production system/client. In such a clients number of work processes that can change to debug mode is limited to half of the DIALOG processes in system. Therefore setup number of dialog processes accordingly. Memory low. Leave the transaction before taking a break! From user’s point of view you really need to at least restart transaction or better to log off and on to system. Basis team would need to re-setup a dialog timeout and/or work process timeout of profile parameters, memory parameters, increase physical of machine, etc.